This updated electronic version of the Directory has been made possible through funding provided by Northampton Borough Council to Northampton Inter Faith Forum for a Development Worker. The significance of faith in the shaping of our identities and communities is increasingly recognised as having potential for bringing people together and building resilience against that which may divide our society. The Forum exists to build positive relationships that strengthen what is held in common and explore with respect, friendship and understanding our differences. Jonathan Sacks, Chief Rabbi in Britain, gave a lecture, “How faith communities can renew civil society”. He asked his audience to imagine being on the London Eye, looking at all the buildings in view, and asking “What goes on in there?” (Cited in “The Tablet” 14 Feb. 09). Amongst the buildings would be Churches, Mosques, Synagogues, Temples, and Gurdwara. What happens in these, and what they have in common, is the sharing of spiritual treasures, bonding and building up communities, and inspiring people to serve their neighbours. No city or town is healthy without them. 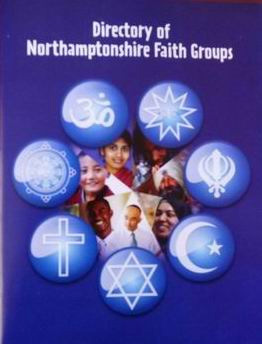 Northampton Inter Faith Forum (NIFF) was formally launched in 2006 for the mutual encouragement of individual faith communities, and to work for better understanding between members of different faiths. NIFF includes representatives of the Baha’i, Buddhist, Christian, Hindu, Jewish, Muslim and Sikh faiths. Members of these faiths live throughout the County of Northamptonshire. Until now there has been no way in which people of all the different faiths could contact each other across the County. Nor has there been a resource for others who need to make contact with the various groups. Now there is. This directory aims to meet the need. In 2008, through the Department for Communities and Local Government, funding became available to provide an Inter Faith Development Worker for NIFF for an 8-month period. This work included the creation of this Inter Faith Directory for the County Of Northamptonshire. NIFF were pleased to manage this project with the support of Northamptonshire County Council, Wellingborough Inter Faith Group, and Faithworks Northampton. The aim was not to set up another organisation, but to gather and organise information about Faith communities, and inter faith groups throughout the County; and to provide details of key contact people within these groups. NIFF believes this will facilitate and encourage inter faith networking both at local level and county-wide. But the directory will be helpful in other ways. Public bodies, including Local Authorities, Emergency Services, and other agencies will find this directory helpful in those many situations where a person’s or a group’s faith and their roots are of importance; and where faith groups are significant providers in their communities. Without doubt, this directory will help promote social cohesion within the County. Please write to the Gurdwara for enquiries. The Inter Faith Network for the UK (IFN) is an inter faith agency recognised and supported by central government: to which central government refers when it needs inter faith advice. It has excellent guidelines on inter faith dialogue and action. As members of IFN, NIFF incorporated these guidelines in their Constitution. Other bodies involved in inter faith work are advised to consult them. IFN are always willing to give advice and help if asked. The Faith-Based Regeneration Network UK (FbRN) is the UK’s leading national multi-faith network for community development, regeneration and social action. FbRN’s UK network currently consists of 1,300 organisations and individuals who regularly receive our free communications and newsletters. Members are from all faiths plus some who do not belong to a faith community but who are interested in the work of FbRN.